The College-Level Examination Program® (CLEP®) allows learners from a wide range of ages and backgrounds to demonstrate mastery of introductory college-level material and earn college credit. CLEP and Career Technical Education (CTE) can and should work in tandem to support career readiness. With an estimated 65 percent of jobs in the economy requiring postsecondary education and training beyond high school, career readiness is increasingly dependent on success at two- and four-year colleges. 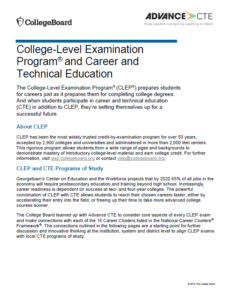 The powerful combination of CLEP with CTE allows students to reach their chosen careers faster, either by accelerating their entry into the field, or freeing up their time to take more advanced college courses sooner. To help state, district and school leaders think through how to place students on pathways that prepare them for college and career, Advance CTE and the College Board partnered to develop College-Level Examination Program and Career and Technical Education. This guide examines how specific CLEP exams can be embedded into or used to augment programs of study by Career Cluster®. For example, when designing programs of study in marketing, it’s important to consider embedding the Principles of Marketing CLEP exam in the programs of study. To learn more about CLEP, look out for Advance CTE’s future report on credit for prior learning, slated to come out in the Spring of 2019. This entry was posted on Thursday, January 24th, 2019 at 10:36 am	and is filed under Uncategorized. You can follow any responses to this entry through the RSS 2.0 feed. Both comments and pings are currently closed.